can poker sites manipulate RNG ? Similar Threads for: can poker sites manipulate RNG ? It seems that sites do do this, however that may just seem to be the case because in online poker you go through so many hands so much quicker than a live table. My personal take on this is ….. anytime a game is constructed using programming and scripts………. Nothing….. and I mean NOTHING is impossible. There will be tons of individuals who may disparage these remarks, but that’s ok, the world is full of incredibly gullible people. I think they can easily manipulate the rngs.Just check out 'random .org'.The bigger sites would be risking a lot to do that.I was watching a science show and the expert said real life random is not 100%.I think he said ~93 or ~97%.Some poker magazine did a review of rngs of some poker sites and found their rngs operated their randomness from high 70s to 90%.So thats a long way from 100%.I'm trying to find this stuff in the archives to verify . Well in programming there is no random number generator which is fully random but i doubt that pokerstars are cheating. As the biggest online poer site they have too much to loose if their reputation is harmed. Same about the other big poker rooms. Dunno about smaller local operators. re: Poker & can poker sites manipulate RNG ? I´m systems and game developer, there can be a manipulation script to privilege some player. I have already done a C # simulation showing the algorithm from the shuffling, distribution, betting, checking of winning hands, pot distribution and so on. Without the supervision of some serious entity, there is no way to have credibility in the game if there is no way to confirm the smoothness of the game. We have 4 players on the table, tournament with ID 1234. The names are Eder, Ryan, Mark and Joseph. before starting to distribute the cards the script will check if anyone on the list will benefit. Not to mention that I already know the order of the cards before hand. There are 52 cards in the deck so I store them in an array of 52 positions. The first 8 are aimed at the players, the 9 is the first burn, the 10 to the 12 position are the flop. The 13th is the second burning to 14th is the Turn, the 15th is the third burning and the 16th is the River. With all the advance, without having to PLAY I already know that player X will have the winning hand due to the combination of values. The first player will receive the cards in positions 1 and 5, the second player will receive the cards 2 and 6, the third player will receive the cards 3 and 7 and finally the fourth player will receive the cards 4 and 8.
in this way you would already know in advance that player 2 would win the hand with a pair of Ace. In this way the function of forging the result where you will invert the cards of positions 15 and 16 enters, causing player 1 to have a Straight Flush of 2 to 6 of hearts. detail: I doubt there is any site that has sufficient verifications that it does not happen. does it happen? I don't know. More easy is to give a bot at the table the flop-turn and river cards preFlop, but there you get the same questions. I'm sure many people keep statistics, all graphs I've seen are within probability. 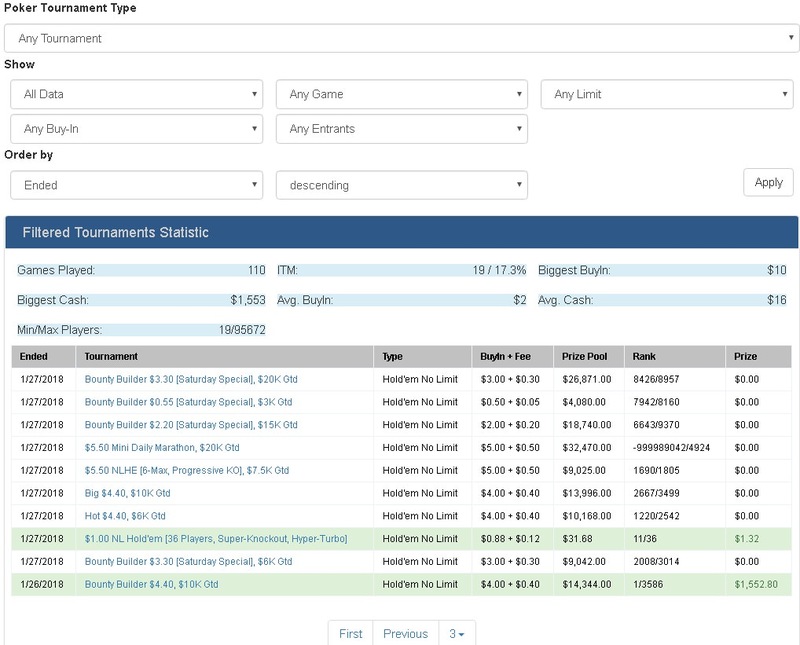 have a look at this:It was his very first tournament at PokerStars. Check the screenshot. He had $250 bounty... 4.4 buy in. I've been watching him when 160 players left. He was chipleader with x3-x8 more chips than 2nd after him. What kind of hand will he fold if he called push in past with 84o? He busted out approx. 30+ players since i started watching him... all his hand have been trash hands... people pushed with aces and lose to his 79. He busted me out with AJ vs my AQ on a preflop allin, he got 789T community cards... Many many times he was raising and folding to my push, until that hand when he got his straight. I am more than sure that it is possible. That is why I do not play those games I prefer to play MTTs with more than thousand people, then there is not so big chance that I can get at the tables with bots. I do not recommend RNG games, especially, those `spinngo` type tournaments where you play with 2 other poker players. But on the other hand, my friend makes a decent money from those tournaments. Well any software can be manipulated if it is not monitored and checked regularly. Regulations are slowly being applied to online gaming in more and more countries so these companies need to register locally, pay taxes and be supervised by the responsible agencies to continue working and expanding their business. Considering all this and that their reputation is the most important thing i doubt that at least the biggest players will dare to manipulate the game in such way. Of course we can never be sure. Even in casino you can not be sure that one or more players on the table are not related to the man who shuffles the cards in any way so that he gives them better cards. In fact everything can be manipulated no matter if it is software, machine (for example shuffler) or there is human involved. We can not be 100% sure but i personally trust the biggest players that they are not doing it or at least not doing it on a large enough scale to affect many people and be noticed. True,I play on pokerstars,party poker and ACR and dont think they would risk their reputation. Great explanation.Any unreputable site could easily do this. The lower the stakes you play the higher chance you'll find yourself in situations that make you post questions like this. Lower stakes involve players more likely to push with hands you deem not a good move. I.e anything suited, 67o, 78o, 45o-even any hand with an A or a K in it. What many people don't realise is a hand like Q7s still has 35% equity over a premium hand like AKs. So you will lose 1/3 of the time. When you win in this situation you never remember it-it's just another donk pushing with rubbish and you win because you should win. However when you lose in this spot your brain tends to remember it as a 'bad beat' even though you should lose here 35% of the time. Bad players tend to have 'good runs' where they win with only 35% equity multiple hands in a row and find themselves with huge stakes early in MTTs but they will never make the final few spots because they simply aren't good enough and probability will eventually equalise and they will be knocked out. Till now balance seems to be around 50%. Will see when i have good enough number of tournaments to make it more reliable and will share the results. Although game manipulation would be possible, given the regulations that govern online poker sites it's highly unlikely that a "fixed" system would pass examination. With that said is it possible to build an algorithm that would allow such things? Yes - easily and as a programmer myself it's easier than most think. I would think its more likely that sites would program their system toward stacking the deck in such a way that action is more likely, increasing pot sizes, thus increasing their overall rake. Sliders for this would make more sense over "make this player win" type scenarios. Would the system know who is likely to win the pot? Maybe, depends on how they handle their shuffle and dealing mechanics. If their "randomized" shuffle is done prior to the hand and then there is a map of the deck of cards stored and as a card is needed one popped off the top or bottom, whatever, then the system will know who will have the best possible hand before play even starts. However, if they just keep a mapping of the deck then a "used card" list of sorts, then randomly select a card from the deck that hasn't been used when required, then probably not. With all that said, that doesn't mean their "randomizing" algorthim in both instances doesn't have weighting or seeding that influences the card selected. I wouldn't be surprised at all if this were the case as doing so can manipulate table action and force larger bets and pots, for the rake. Hence why i'm always putting quotes around any use of the word random and its variations. In the end - the casino/room always gets the best odds out of everybody. /removestinfoil. And now just think one step ahead: WHY is PS the biggest? Because they never got caught and pretend to be the most serious!!! If I had a pokersite, I would rigg out the last pennie of you!!! It is not that obvious on PS, but on other sites I can see clearly, that I get married with the pot and the WINNER is.... always the other with one card flush, straight or similar. on 888 it seems every second board contains 4 cards of the same suit. I dealt 100 hands with real cards and got one time 4 suits on the board. ok, I have one: Do you think, the nicest guys on earth came one day to the idea, to open a pokerrroom??? Of course everybody is working to win money including the poker rooms but they are making it anyway from the rake and it doesn't matter who will win the hand. Yes they can have bots playing and arranging hands for them to accumulate additional income and you can never be 100% sure what happens behind the curtains but what choice we have? Live play at the casino can also be manipulated and if i want to play online (and i like it so i want) i prefer to use the biggest room. Of course everybody has its choice. So far i have not seen anything suspicious but i play from too soon (2 months and a half) and i play only freerolls where maybe there is no interest for manipulation. Will see how it goes in the future but for me pokerstars is good for now. So far i have not seen anything suspicious but i play from too soon (2 months and a half) and i play only freerolls where maybe there is no interest for manipulation. don't do it but for sure there are some that do. I know ( and knew ) I am not the only one seeing this , sooner or later some of those sites will get caught that they use bots for their own profit. After all who can check on them and prove that X,Z or Y bot account is owned by the said site? This should be in the Rigtards Thread! Why would sites rig anything. Their take comes from the rake. Here's a question: as a poker site owner, why limit yourself to rake when you can set up a system where bots can win people's money as well? There's not much to operate an RNG that passes randomness stat checks, but if you just run the RNG ahead of time and just make the community cards known to your bots on every hand, then who is going to catch you and how? Bots will win too much? Make them win once in a while and then make them lose for a while. Who is going to audit the player database to verify that the players involved are real or not? Who verifies that the RNG runs "live" and that it sends cards to each table in real time? re: can poker sites manipulate RNG ?